imshow with masked array input and out-of-range colors. 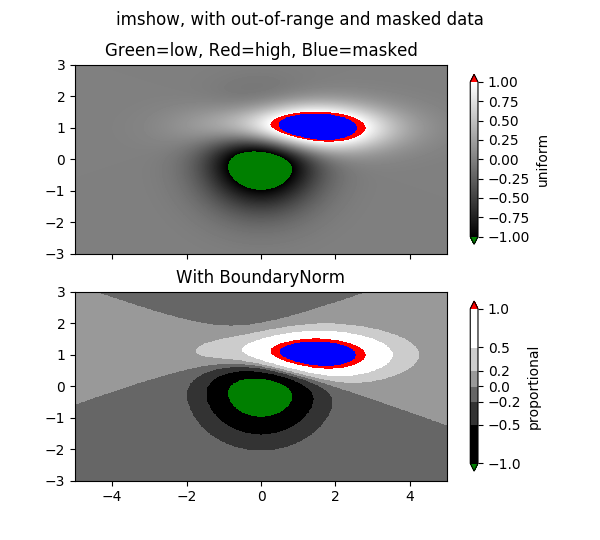 The second subplot illustrates the use of BoundaryNorm to get a filled contour effect. # to make the bad region transparent. This is the default. # first and last colors in the palette, respectively. # range to which the regular palette color scale is applied. # Anything above that range is colored based on palette.set_over, etc. # Plot using a small number of colors, with unevenly spaced boundaries.